President Donald Trump signed a historic new trade deal with the leaders of Mexico and Canada on Friday, Nov. 30, 2018, that will replace the 24-year-old North American Free Trade Agreement, or NAFTA. Nervous school bus manufacturers have been especially concerned about what will happen with possible tariffs on imported steel from Canada. Whatever it is called, Trump said he expects the deal to soon be ratified. “I look forward to working with members of Congress and the USMCA partners—and I have to say, it’s been so well reviewed, I don’t expect to have very much of a problem—to ensure the complete implementation of our agreement,” he commented at the signing ceremony in Buenos Aires, Argentina. Although U.S. school bus manufacturing was not specifically mentioned in comments today, President Trump’s statements regarding the automobile manufacturing industry provided some hints on what may apply to the school bus industry. 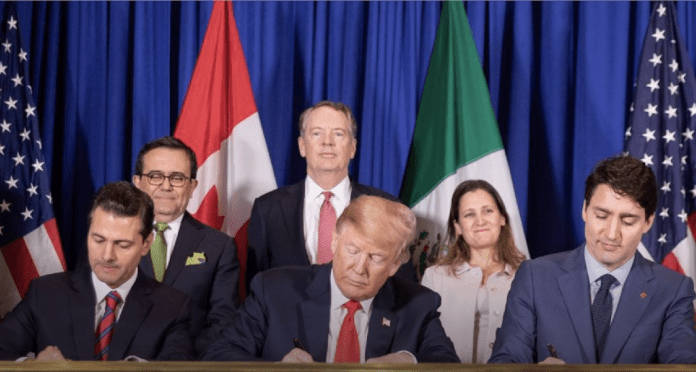 The USMCA is also expected to “cut red tape at the border, streamline trade, and reduce regulatory uncertainty,” he added.